Active area 944 was still visible and looked more or less the same as it did yesterday. Very clear and pretty cold night. 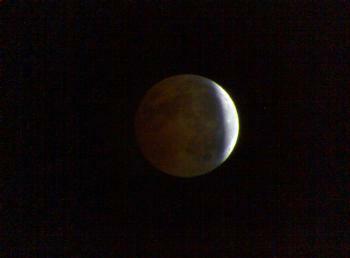 Arranged to meet up with John Turner at Woodland Waters to observe the total lunar eclipse. I took along my Antares 905 and a pair of 10x50 binoculars and John brought his Sky-Watcher Explorer 130M mounted on an EQ5 mount. After setting up I started out with a brief look at Saturn (given that the umbral phase of the eclipse wouldn't be starting for a short while). The first thing I noticed was that seeing seemed to be very steady. The view of Saturn in the 905 with the 6mm eyepiece was nice and sharp. The shadow of the rings on the planet seemed obvious and I kept getting a good hint of the Cassini Division. Titan was easily visible and, off to the other side of Saturn, closer than Titan, there appeared to be another moon visible. Checking with Starry Night I suspect it was Rhea. 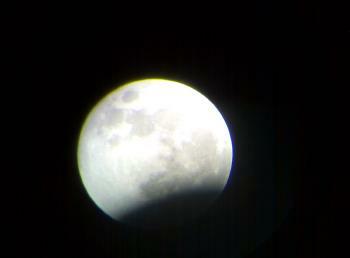 Having observed Saturn for a while I turned to observing the lunar eclipse. At 21:04 UT I had the impression that there was less visible contrast between the highland and lowland regions of the Moon. This was especially noticeable on the side of the Moon that was heading towards the Earth's umbra. By 21:24 UT this loss of contrast had become much more noticeable and there was obvious darkening of the part of the lunar surface that was deepest in the Earth's penumbra. At 21:30 UT the umbral phase started and, very quickly, it was obvious where the umbra was. To the naked eye it looked like part of the Moon had gone missing. Via the 905 detail was still visible in the umbra, it looked like a very dark gray shadow. I noticed that Tycho had been fully consumed by the shadow at around 21:48 UT. I noted at this point that the umbra seemed very dark (much darker than I remember it looking during last year's partial eclipse), dark gray to almost back looking in places. I also noted at this point that the sky was obviously getting darker and that my shadow was starting to fade. By 22:05 UT we were about � way towards totality and I was starting to notice a slight red/brown hint to the umbra. In the 905 the umbra showed no colour, still just a dark gray. At 22:16 UT, via the 905 and with the 10mm eyepiece, I could see a star quite close to the Moon. This star hadn't been visible before so it seemed pretty clear that a lot of the Moon's glare had gone now. Checking with Starry Night it appears that it was 56Y Leonis (HIP53449, TYC261-384-1). By 22:32 UT I was starting to see a hint of red/brown colour in the deepest part of the umbra when viewing via the 'scope. The redness was now very obvious to the naked eye. By this point it was looking like it was going to be a reasonably dark eclipse. At 22:44 UT it was obvious that totality had begun. Although there was an obvious hint of redness to the Moon with the naked eye it wasn't that red. There was an obvious difference in brightness between the part of the Moon that was towards the edge of the umbra and the part that was deepest in the umbra. By now the sky was a lot darker — many more stars were visible, as were the more obvious deep sky objects such as the Double Cluster and M44. I could no longer see my own shadow and, unlike earlier in the evening, I now needed a light to be able to move around safely. Mid totality was around 23:20 UT. On the Danjon scale I would estimate that the brightness of the eclipse was L2. At 23:32 UT I observed a short and bright meteor head south of Auriga in the direction of Orion. By 23:35 UT it was obvious that the brighter part of the shadow had "swung" around to the edge of the Moon that would exit the umbra. By 23:58 UT the first bright patch was visible to the naked eye, totality had ended. Around 00:17 UT it was obvious that the sky was starting to brighten again. M44 was still visible but much harder to see than it had been during totality. I could also see my own shadow again. At 00:24 UT, with the Moon about � way out of the umbra, some thin cloud started to move in front of the Moon. While it didn't put a stop to observing it was a cause for concern given that thicker could cloud be seen towards the west. Around 00:36 UT I watched Tycho emerge from the umbra. Also, around this time, I noticed a star pretty close to the lit limb of the Moon (the limb that had already emerged from the umbra). By the looks of things it seemed like it might actually be occulted by the Moon before the Moon was clear of the umbra. I decided to stay at the eyepiece and see how long I could follow the star. Later checking suggests that I was watching 59 Leonis (HIP53824, TYC268-1064-1). From my location this star would not be occulted by the Moon but would come very close. Western parts of the UK would see an occultation. At 00:39 UT I noticed that the objective lens of the 905 was starting to badly mist up (this might have started happening some time ago but it was now very obvious due to the glare from the brightening Moon). The star was still just visible at 00:49 UT, although I now struggling to see it in the glare of the Moon. I carried on watching it for as long as I could and I lost it, very close to the Moon's limb, at 01:01 UT. It appeared to have been occulted (but see the note above). By 01:04 UT the sky was now very bright again, only the brightest of stars were visible and I could no longer see the naked-eye deep-sky objects I'd been able to see earlier. I could also now walk around without the aid of a torch without any danger of bumping into anything. I started to pack up during the final moments of the Moon exiting umbra and, at 01:12 UT, I watched the Moon finally move out of the umbra. Now cold and tired we finished packing up and called it a night.